WILDFLOWER descends from one of MacDonald Ranches soundest-structured, best-uddered and top producing cow families. Both her mother and grandmother are enrolled as donor dams in MacDonald Ranches ET program. Her dam is also the mother of MAC BLACK BLOSSOM who sold to West Hills Ranch in Salers Supreme 2008. 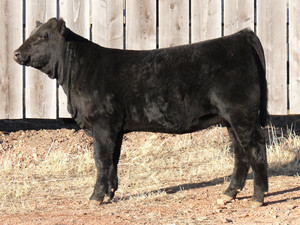 Her grandmother, LIL BLOSSOM, was a class winner at the 2003 National Salers show and is also the dam of MAC TONYA 43T, a class winner at the 2008 National Salers show. WILDFLOWER is long-sided, clean made and likely to be one of the top show prospects to come out of the MacDonald herd this year. She offers double opportunity for both showring success and a productive future.